New Zealand led the world in giving women the vote, but more than a century later it is dropping in international indexes measuring the gender gap. 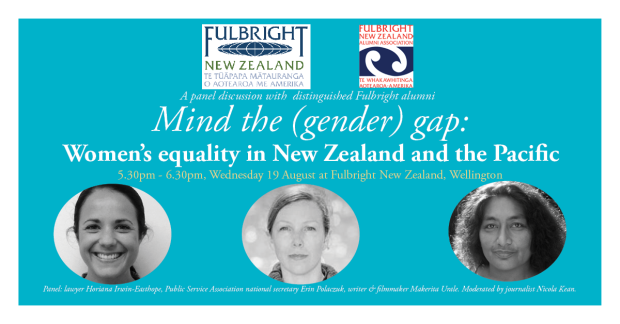 Distinguished Fulbright New Zealand alumni discussed why and where to from here for women in New Zealand and the wider Pacific region during a panel discussion at Fulbright New Zealand on 19 August 2015 in Wellington. The event was attended by alumni, members of the public, representatives of National Council of Women and Ministry for Women. The panel consisted of lawyer Horiana Irwin-Easthope, writer and filmmaker Makerita Urale, Public Service Association national secretary Erin Polaczuk and journalist Nicola Kean. Horiana Irwin-Easthope (Ngāti Porou, Ngāti Kahungunu, Rakaipāka) is a solicitor at Kahui Legal. She was the 2013 Fulbright New Zealand-Ngā Pae o te Māramatanga recipient and has a Masters of Law from Harvard University. Makerita Urale is a Samoan-born writer, theatre producer and documentary filmmaker. She was the 2010 Fulbright-Creative New Zealand Pacific writer-in-residence. Nicola Kean is a current affairs TV producer and a 2010 Fulbright grantee, with a Masters of Science from the Columbia Graduate School of Journalism in New York.